Welcome to "Your Face!" 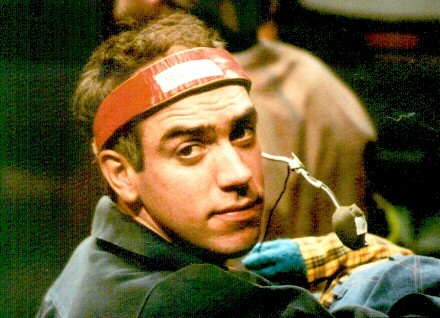 the fan site dedicated to the talented Muppeteer, Richard Hunt. 1-07-05--Another year, another update. I've been overwhelmed with school, I haven't had much time for anything. Perhaps sleeping, but very little of that. It's a shame I can't major in Muppeteer Biographies. But, who needs to do actual work when you have such wonderful people willing to submit stuff? The lovely Megan has managed to dig up a tribute that appeared in the January 11, 1992, edition of the Gettysburg Times. The super awesome Leighanne Mazure brightened up my inbox with her very lovely tribute to Richard. 1-07-04--I meant to update this site, oh, 6 months ago. But then I got busy for awhile, and when I wasn't, I sure was lazy. However, I've now managed to update. The Remembering section has been updated with an obituary from the St. Louis Post-Dispatch as well as one from U.P.I.. The Information section has also been updated. Two of my new best friends have helped me out. The wonderful Scott scanned and sent me Richard's bio from the Muppet Fan Club Newsletter thing. The super great Megan found a wonderful gem of an article from The Record (a New Jersey newspaper). Be sure to take a look at that. 1-07-03-- It's hard to believe that it's been 11 years. I posted this little tribute I made last year. I like it so much, I though I'd bring it back for this year, with a few new additions. "They all had weird childhoods." -- Richard on why many puppeteers like anonymity. "People walk in here and they look at us, and we show them around the shop, and they see all those puppets, and you go and put one on, and do a different weird voice and they look at you, like: 'That’s... that's magical, but the guy's nuts!'" -- Richard on "60 Minutes"
"It didn't matter if he was playing a major character that was driving the scene, or a background minor puppet. He always made it shine in some special and unexpected way." -- Richard from "60 Minutes"
1-01-03-- HAPPY NEW YEAR!!! Yes, believe it or not, this fine site has been around for a year. On this day last year "Your Face!" went public. This is quite an accomplishment for me, seeing that I don't have the proper attention span to take care of a web site longer than a week or two. Hooray for me! While I'd like to say that I have some spectacular update for the site, I'm afraid I don't have anything. This is rather good seeing that work and school have taken a big bite out of my free time. If I had any "big" thing, I'd probably have a nervous breakdown. That's not to say I don't have any new additions to the site. Martin P. Robinson has been kind enough to provide a few pictures of Richard (is that not aweseome or what?). I only have a few, and they are up. You can either go hunting for them, or (if you're not in the hunting mood), you can go to the Jim Henson Productions Press Release, Dave Goelz Tribute, Muppet Show Press Kit Bio, and Martin P. Robinson Tribute to view these nifty gems. 9-24-02-- Here it is, yet another update! If you'll tour the site, you'll notice that I have updated the Info section with a little thing I like to call Did You Know. I have also updated the Remembering section with an obiturary from the Los Angeles Times as well as a tribute from Martin P. Robinson. Plus a link has been added (but guess which one!). That's all for the moment, but be sure to check back! 5-24-02-- Yay! Finally have UPDATES!!! First, I'd like to direct your attention to the On-screen Appearances section, where you will find Richard's part in Oxford Blues (now I'll stop bugging people to send it to me). Then make your way to the Remembering section. There I have added obituaries from The Chicago Sun Times and The Washington Post. Then finally stop by the Links section. You don't have to go in that order, that's just a suggestion. Be sure to come back. I have at least another update planned. 4-22-02-- Ok, I've added a few links to the Links Section. However, I'd like to take the time now to direct you to the Fraggle Rock DVD petition site. Let's tell Henson that we want Junior Gorg on DVD! 4-9-02-- Considering that updates are few and far between, I've been a busy little bee lately. Henson.com has undergone some changes recently. Unfortunately, this means that I can no longer nicely link the information about Richard to this site. So, those links have been taken down. In other news, I've been looking at the newsgroups for stuff about Richard. There's an amusing little quote that someone found here. Past updates and such can be found here. For some reason. Do you have that incredible urge to e-mail me? Do you have a comment or something you would like to add? Do you have a tribute you want to send me? Or do you think I'm asking too many questions? Then, please, feel free to e-mail me. Your Face! is a fan site created to honor the life, work, and the memory of Richard Hunt. This is a fan site and is in no way, shape, or form associated with Richard Hunt, the Hunt family, the Jim Henson Company, or facial stuff that removes zits. Please don't sue me, as I have no money, and you'll most likely end up with erasers or something. Reproduction in part or in whole without permission is prohibited. 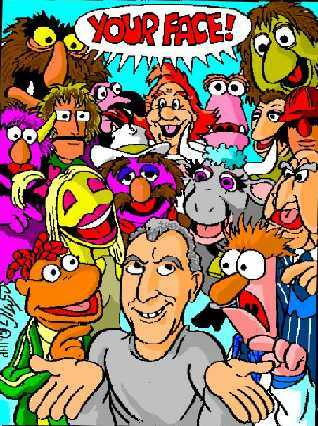 All Muppets, Muppet names, and pictures are copyright the Jim Henson Company.